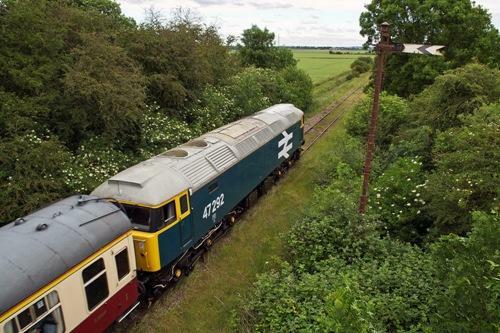 (3) Craig Simmons comments: one thing which did not happen during the day was a plan to run Portion B to Loughborough and back from Rushcliffe rather than simply sitting idle whilst the first portion hogged the single line staff to/from Ruddington. Mark Herriott also confirms it had been decided these extra runs were not of value & may have added complications on the day. Three buses were provided by the Great Central Railway because the passengers on the second portion to leave Rushcliffe Halt only had 35 minutes at Ruddington as they were the first portion to leave Ruddington to get back to Rushcliffe Halt. The buses worked both to and from Rushcliffe to Ruddington. East Leake N (Rushcliffe Halt) 12.48d ? 13.00d CANX 15.40a CANX 15.45a ? Hotchley Hill Down ??.?? ~ 13.00 ? ??.?? ~ 13.48 ? 14.55 ~ ??.?? ? 15.44 ~ ??.?? ? Rudd South Jn (Fifty Steps RR Loop) 13.10 ~ 13.15 ? 13.58 ~ 14.03 ? 14.40 ~ 14.45 ? 15.29 ~ 15.34 ? [ECS from loop at 15.10] ?